OK, so two horrible headlines in one day. But I feel I’m justified in this one. There’s a feature today in the Guardian about how local councils in the UK are pushing to have a penny tax added to each pack of gum to help pay for the cost of cleaning up the gum which gets spat out on to the local pavements/sidewalks. Certainly many pavements in beautiful Edinburgh are horribly marred and scarred by white circles all over the place as louts think they can spoil it for the rest of us. The writer, however, notes that just the act of chewing gum in the first place is the more repulsive act, and I have to agree. Seeing someone chewing away is something I find highly irritating, although I’m not sure why. Maybe I get jealous that I’m not eating or something. I believe in days of yore it was seen as an incredibly ungentlemanly act to eat in the street. What’s more gross of course is when the chewing is done noisily – a horrible invasion of my peace and privacy, almost worse than when someone listens to music too loudly through leaky headphones – at least then I get the satisfaction of knowing that they’re destroying their hearing. But with me it’s not just gum. When someone is eating crunchy food it hits something in me which makes me kind of cringe, but also just want to get out of the room as soon as possible. I’m not sure if it is again the jealousy that someone is eating something while I’m not, or just the weird echoey crunch as you hear the potato chip/crisp/nacho/celery/whatever get acoustically resonated and broadcast through the eater’s jaw and skull. It just turns my stomach and I wish I knew why. Maybe I should get help and/or a life. Longtime viewers (like Emma) of The Price Is Right will know that the host, Bob Barker, is an outspoken proponent of having pets sterilised to help keep the population of unwanted cats and dogs down. In fact I believe that if you want to apply for tickets you have to have used a postage stamp for a national pet sterilisation charity on your application. If you’re interested, it looks like Amazon are doing a rebate on Apple iBooks, so they’re a pretty good deal. A bit out of my range, but maybe one day. 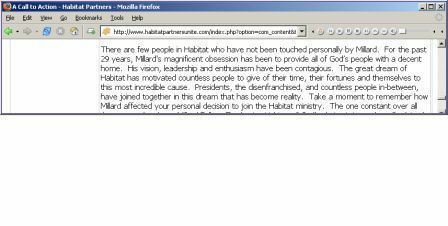 I heard recently that the founder of Habitat For Humanity, Millard Fuller, who is a pretty amazing guy in many respects, has been asked to step aside by the Habitat Board. Apparently there were charges raised in March 2004 by a former Habitat employee who alleged that Fuller engaged in inappropriate conversation and touched her arm. This allegation has been strongly denied and right now the Board has concluded that there was “insufficient proof” in the allegations. However Fuller was still asked to resign, along with his wife. Toby was pretty funny last night at dinner – Emma helped him get some baked beans on his spoon, and he casually said, “Thanks”. For some reason it was very amusing, more so than when he politely and sincerely says, “Thank you”. It’s nice that he’s getting more relaxed with his language, and interesting how naturally it comes to him. Also at mealtimes lately we’ve been having an ongoing game which started when he was refusing to eat some veggies (a rare occurrence). Emma had the inspiration of asking him what kind of animals eat broccoli, because he could be that animal and eat some more. He confidently shouted “Rhino!”. So he was a rhino and ate some broccoli. It turns out that in fact rhinos eat most foods that Toby likes, with the exception of beans and fish fingers/fish sticks, which are favorite of polar bears, and pea soup, which is typically eaten by birds, and I’m sure you’ve seen giraffes grazing on toast. It’s a very serious business in Toby’s world. Something both Emma and I have been finding tricky lately is getting Toby off to sleep successfully on nights when I’m out. He’s been pretty good at going off to sleep when we’re both home, no matter which one of us takes him upstairs, or if Emma’s out, but about 70% of the time if I’ve had to be out I’ll get home and he’s still up. This makes for a rather stressful time for Emma, who would have been looking forward to some time to herself, and for me, as I’ll be looking forward to quiet time with Em. Plus it’s not like I’ve been out enjoying myself particularly – usually it’s after choir rehearsal or like last night, search committee at the Cathedral – I’m chairing the new committee which is working on filling a new priest position. We’re not quite sure what Toby’s deal is with this – he doesn’t seem upset when I go out, and he didn’t have a problem last Friday when both Em and I were out and his babysitter put him to bed. I’m sure it’s just a phase. He did fine in his new class at school yesterday by all accounts. He seemed quite happy when he got home, and his teacher, Joe, was saying how smart Toby is – he seems to be keeping up with the older kids in pretty much everything. I was there to drop him off this morning, and noticed how much younger Toby seems – it was a bit strange. Toby himself did just fine, he walked in confidently and found his chair for breakfast. He wasn’t bothered when Emma and I had to go, in fact he pretty much pushed me away. You are currently browsing the andrew.mogendorff.com blog archives for February, 2005.